Designed for anyone who has never fenced before, who has never fenced sabre, or who took fencing “a while ago” and forgot most of what they learned. Please see the schedule of classes for exact times for the age group you are interested in. You’ll be able to attend up to 2 of our practice sessions a week for 1 month: see the schedule for the appropriate times for your age group. During that first month, we’ll introduce you to the basics of fencing. At the completion of your first month, you’ll automatically roll over into our Basic Membership which will be prorated according to the number of days left in that month. You’ll need to purchase your own set of Fencing Knickers to wear at that time in order to continue participating in practice sessions. Your total cost is $99! Add a second (or third, or more!) family member for $30 off! If you’re looking to take advantage of this option, you’ll need to register for the subsequent members, but don’t actually pay immediately. Send us an email, and we’ll verify the family members, and apply the discounted rate to the additional memberships. Then you can either log in and pay through the website or pay when you arrive at CEFC for your first class! All other equipment for the beginner classes is provided. Wear sweatpants, t-shirt, athletic shoes and bring a water bottle (or we have water for sale). Come join us! Do you think you have what it takes to be a Fencer? Have you tried other sports, but just haven’t found the right fit? Are you looking for an activity that will allow you to show off your individual efforts as part of a community of athletes? 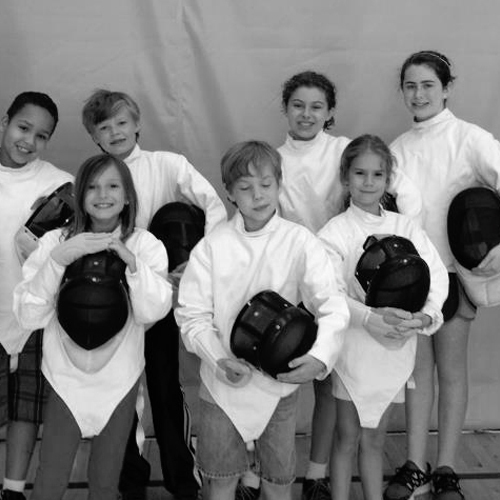 Our Recreational Program allows you to explore the sport of fencing in an exciting, group instruction-based format. You’ll be able to attend classes a couple of times a week, and participate in group drills classes and open bouting. Test your skills at our In-House tournament series and other events around North Texas and learn what it means to be a SabreCat! Basic Membership (2 practice sessions a week) is $130 a month and Standard Membership (3 practice sessions a month) is $170 a month. First month is prorated based upon start date. Add a second (or third, or more!) family member for $30 off! If you’re looking to take advantage of this option, you’ll need to register for the subsequent members, but don’t actually pay immediately. Send us an email, and we’ll verify the family members, and apply the discounted rate to the additional memberships. $10 monthly discount for autopay (a 30-day notice is required to stop autopay). There is a $39/year Club membership that renews each August 1. Includes half price discount on all Weekend Intensives and discount on week-long camps. Standard Membership includes access to Athlete Yoga and Conditioning Classes (open to athletes age 13 and up). Ready for serious athletic training? Do you harbor dreams of competing at the elite level? Looking to represent a Division I NCAA program or even Team USA on the international stage? The Competitive Fencing Program gives you unlimited access to the club during regularly scheduled hours as well as specialized training times, in addition to all of the group training aspects of the Recreational Program. 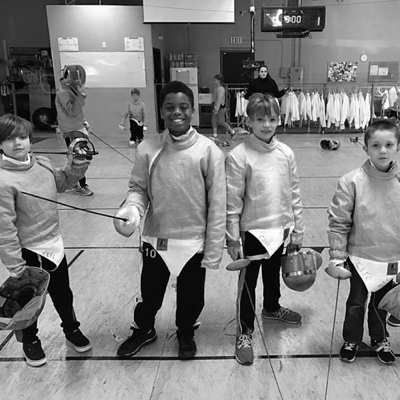 You’ll receive personalized instruction and periodized training plans as you pursue the individual sport of fencing as part of our competitive team, the SabreCats! Performance Membership (unlimited access) is $205 a month. Add a second (or third, or more!) family member for $30 off! Autopay is required for Performance Memberships (a 30-day notice is required to stop autopay). Includes all Weekend Intensives and discount on week-long camps. Also includes access to Athlete Yoga and Conditioning Classes (open to athletes age 13 and up). CEFC hosts a number of special training opportunities for our athletes throughout the year. Our Weekend Intensives bring together athletes from all our programs, and are attended by fencers from around the region. You will leave this weekend a better sabre fencer than you started! Intensives are Friday evening, Saturday, and Sunday, and are recommended for all Regional and National level competitors, as well as those looking to begin Regional level competition. These Intensives are included in Performance Membership, and are $50 for Basic and Standard Members. The cost for for non-CEFC members is $100. Our Competitive Training Camps are focused on competitive training for our existing athletes. This year we will host a week long Summer Nationals Prep Camp for Youth and Teens, an Adult Summer Nationals Prep Clinic, and Pre-season Conditioning Camp and Youth Intermediate Camp. These events feature guest coaches, and are highly suggested for anyone who is competing or is interested in competing and Regional and National events. CEFC Beginner Fencing Camp is an exciting four days that gives kids ages 8 to 12 a fun and safe introduction to the exciting Olympic sport of Sabre fencing. Each session provides a dynamic and creative outlet for all that youthful energy! In Fencing, private lessons are the ideal way to advance your fencing skills, create muscle memory, and get individualized instruction and mentoring. Generally speaking, fencers start out in group instruction, and add in private training as they become more advanced. Members who would like to schedule a private lesson to augment their training can do so at the cost of $25 for a 20-minute session. (Remember, fencing is very an intense sport.) We also offer drop-in rates for visiting fencers. Please email [email protected] for more information. We also offer Individual Lesson Packages dependent on competitive goals in consultation with coaching staff. Number of competitive lessons is determined by coaching staff in context of competitive season and training goals. Regular participation in tournaments at the appropriate level is expected. Autopay is required for Lesson packages. CEFC offers off-campus PE, birthday parties, team-building programs, fencing demos, Scout badge-earning opportunities, and other special events designed to suit your needs. Please email [email protected] or call (817) 428-5599 for pricing information and scheduling. During practice and competition, fencing athletes wear masks made of wire mesh, and multiple layers of protective clothing. Fencing remains one of the safest sports for kids and adults with injury rates far below those of the more popular sports such as soccer, volleyball, and of course, football. Most hits you will receive during a fencing bout do not hurt at all; the blade is designed to bend on impact and thus they kind of feel like getting poked with someone’s index finger. Fencing is a finesse sport where speed and dexterity win out over brute strength. In competition, we utilize an electronic scoring system that only requires one to lightly touch the opponent to register a hit. There is no need to hit your opponent forcefully… only to hit them quickly and solidly. At our club we offer classes to anyone age 8 and older. There is no upper limit. The beginner class costs $99 and includes membership in our club and the national organization, four beginner-level classes, and a fencing glove. Tuition is $110 a month after that (on autopay) and includes all fencing equipment for the duration of our bronze program – usually six months. Our new beginner class starts at the beginning of every month. For people ages 13 and older that first class would be on a Monday from 8-9 pm. For anyone ages 8 to 12, that would be on Wednesday from 5:30-6:30 pm. Also all ages can attend Saturday from 9-10 am. You should wear a comfortable cotton t-shirt or sweatshirt, a long pants (thick sweat pants are ideal), and athletic shoes. Cutting Edge Fencing has bathrooms to make clothing changes. Can I just come in and try it out or do you offer a trial membership? We also offer a free class every month so that people can come in and try out fencing at no risk. This is typically on the last Friday of the month from 7:00 to 8:30 PM. If you’d like to reserve one or more spots, please click on the link below, or call us at 817-428-5599. You’re also welcome to come in and observe any of our other classes that occur during the week. What weapons do you fence? At CEFC we specialize and train in Sabre, the most dynamic and exciting of the three disciplines in Olympic Fencing. We supply all the fencing gear needed while you are in the beginning levels of training, roughly, the first six months. After that, you’ll be ready to purchase your own! At CEFC, we take students as young as age 8. We have an active and growing group of young athletes that participate in programs specifically designed for their age and skill level. In competition, there are age-specific competitive categories that ensure budding athletes are matched up in an age-appropriate manner. Oh yes we do! Our Adult level classes combine adults and older teens together in training groups. We have a solid group of fencers over the age of 25 who enjoy coming together every week and engaging in swordplay. You won’t be the only adult in a crowd of little kids! Fencing truly is a life-long sport. USA Fencing has established a category for anyone ages 39 and older, with age groups all the way up to the Over-80 category. At CEFC we are pleased to have an incredibly dynamic group of Veteran fencers who push one another to reach both individual and group goals. We currently are the home of two highly-ranked Veteran female Sabre fencers and are working hard to get others on the National Points list. All you need to join this group is to have taken a minimum of 39 trips around the Sun! Fencing is one of 5 sports that has been in every single Modern Olympic games and CEFC fencers compete together on a regular basis. Our competitors are known collectively by the moniker “SabreCats.” We have an in-house series of competitions for Novices to help you get started. 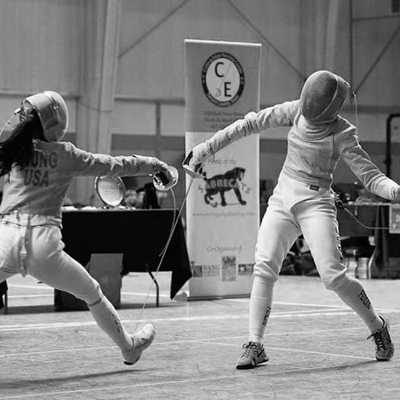 When you’re ready, we’ll help you get involved in Regional level competition (and CEFC helps host a number of really strong tournaments that attract fencers from all around the country). Looking to test yourself against the best in the country? We regularly have fencers participating in the North American Cup series hosted by USA Fencing, the national governing body for the sport of fencing. What does the Annual Membership cover? The membership covers your legal liability while fencing in our facility. It includes a basic, Non-Competitive membership with USA Fencing and is a requirement for fencing. You can upgrade your membership at any time to the US Fencing Competitive membership, which gives you the right to fence in tournaments outside the club, get a magazine, and vote in US Fencing elections. What are the Weekend Intensives? 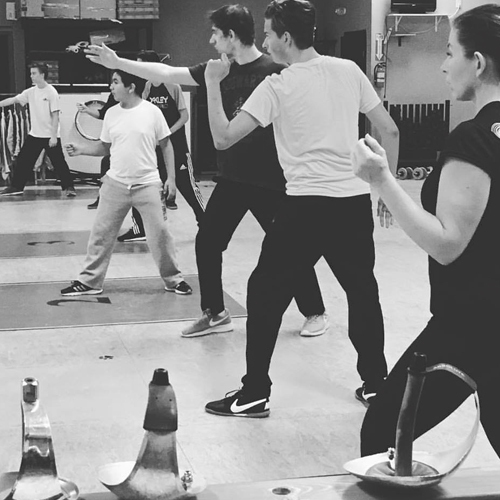 A weekend (Friday evening, Saturday and Sunday) of intensive training for sabre fencers open to anyone who wants to take their fencing skills up a notch. Activities include drills, conditioning, and directed bouting. Full equipment is required (including knickers for drills and bouting sessions). Bring a lunch, snacks and water for each day! The price is included in CEFC Performance Program Membership and is $75 for other attendees. Please register in advance. Sign up for Next Intensive. How long is the fencing season? Fencing is a year-round sport that typically begins August 1 and ends with Summer Nationals in late June/early July. 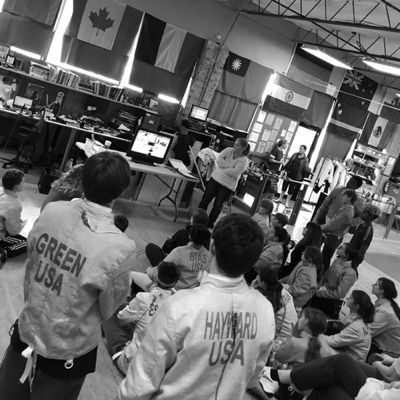 Since fencers practice and compete for so many months, it’s important to listen to the CEFC Coaches, who are well-versed in mesocycles and appropriate training patterns for fencers, about when to train hard and when to back off a bit. Sometimes it’s time to have two lessons a week and multiple challenging workout sessions, sometimes one–or no!–lessons, some light footwork and yoga. Can I do fencing for Off-Campus PE? Absolutely! 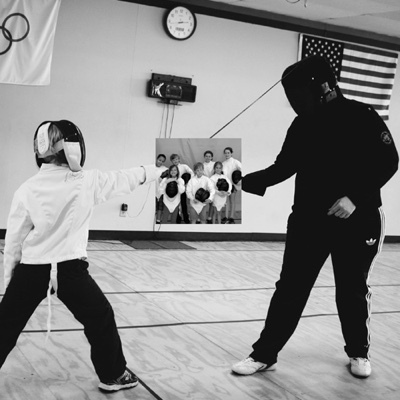 As an Olympic sport, fencing is recognized by the Texas Education Agency as being eligible for off-campus PE credit at both the Middle School and High School levels. Policies differ between different school district, so we encourage you to reach out to your guidance counselor for specific policies at your school. CEFC is an accredited provider for Birdville ISD, Grapevine-Colleyville ISD, Keller ISD, Hurst-Euless-Bedford ISD, Fort Worth ISD, Trinity Valley School, All-Saints Episcopal, Fort Worth Country Day. How does Olympic fencing differ from kendo/HEMA/lightsabre/etc? Fencing is a distinct martial art with its origins in medieval swordplay. It has its own rules, customs, and techniques that have evolved over the centuries. Fencing has been part of the Olympic movement since the beginning and is one of five sports that have been contested at every modern Olympic Games. Fencing Athletes wear protective masks made of wire mesh, several layers of protective clothing, and wield highly flexible metal weapons. Scoring is conducted through an electronic scoring system that only requires one to lightly touch the opponent to register a hit. Fencing is conducted under the auspices of the FIE (the international federation for Olympic Fencing) and USA Fencing (our national governing body) that set the rules and govern how competitions are structured. Where can I go to find out more information about the sport of fencing? There are a number of really good resources on the internet that we can recommend. 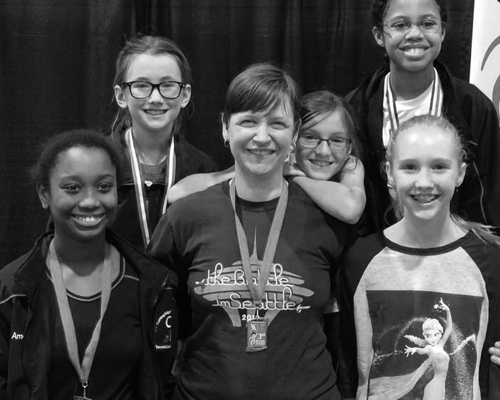 The SabreCoachKate Blog (https://sabrecoachkate.wordpress.com/), run by our very own Coach Kate, has a wealth of information for beginning fencers covering topics such as how to wash your fencing gear, what the referee hand signals mean, how to practice fencing on your own, and what to expect at a tournament. The Academy of Fencing Masters blog (http://academyoffencingmasters.com/) contains a wide variety of different topics including how to qualify for national events, what to look for in a fencing coach, the life-long benefits of fencing, and a wealth of other great topics. The Sydney (Australia!) Sabre Center (https://www.youtube.com/user/sydneysabrecentre), Cyrus of Chaos (https://www.youtube.com/user/CyrusofChaos), FIE (http://fie.org/media/fanzone), and FencingVision (https://www.youtube.com/channel/UCA40s4GODjkaJ9JeM0fBcdg) YouTube channels have a number of great videos from tournaments around the world, including Olympic Games, World Cups and Grand Prix events, World Championships and other important events. There are also compilation videos featuring favorite fencers, rules updates and analysis of trends in competitive fencing. The Fencing subReddit (https://www.reddit.com/r/Fencing/) is an active, friendly online community that has lively discussions on a wide variety of topics including where to fence in a given city, opinions about fencing gear, discussions of current events in fencing, and many other topics that welcomes questions from all participants. Fencing can be a great event to have at a birthday party. We usually are available on Friday nights and Saturday and Sunday afternoons to hold birthday parties. 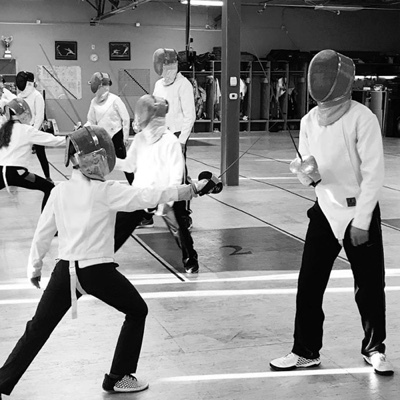 If you would like to hold a birthday party at Cutting Edge Fencing, we have a flat rate of charge $200 for up to 10 participants (90-minute fencing session and 30 minutes of refreshments provided by the family) with additional participants at $25/person. This price includes equipment rental. We have also done Scout groups, Church groups, girls/guys night out, other special occasions and after-dance and after-prom parties in the past. Please contact us to schedule the date and time. Fencing can be an awesome team building exercise or a great way to celebrate an job well done. We usually are available on Friday nights and Saturday and Sunday afternoons to hold these special events. If you would like to hold a corporate event at Cutting Edge Fencing, we have a flat rate of charge $200 for up to 10 participants (90-minute fencing session and 30 minutes of refreshments provided by you) with additional participants at $25/person. This price includes equipment rental. We have also done Scout groups, Church groups, girls/guys night out, other special occasions and after-dance and after-prom parties in the past. Please contact us to schedule the date and time. Our coaching philosophy is athlete-centered and revolves around helping, educating and guiding. We assist athletes in achieving their goals as they learn new things about the sport and about themselves in a positive, respectful, and collaborative environment. How can families get involved together in fencing? We encourage families to get out on the fencing strip together and offer a special membership rate to help them do so. The first family member pays the regular rate; each subsequent member in the immediate family living at the same address gets a $30 per month discount. How can I get involved in the CEFC community? Throughout the season there are multiple opportunities to volunteer, including repairing equipment in the Armoury, overseeing chores on Saturday morning, learning to run Bout Committee at a tournament, helping with tournament set-up and tear down, creating social events held at the club, organizing the end-of-season party, hosting fencers visiting from other cities, etc. How can I best support my fencer? Encourage, encourage, encourage. A fencing parent’s (or sibling, partner, spouse, etc) job first and foremost is to bring their fencer to practice and tournaments in the right frame of mind. They need to be well-rested, well-fed, and excited to practice and compete. When they are finished with practice/competition, please ask them how it went, what they did well, what they feel they still need to work on; please do not make suggestions or coach them. That’s the job you’re trusting us to perform for you!